Are French Workers Lazy? Or Are We Americans Stupid Workaholics? Mark your calendar for October 6th and be sure to register ASAP for "Bloom Where You're Planted." 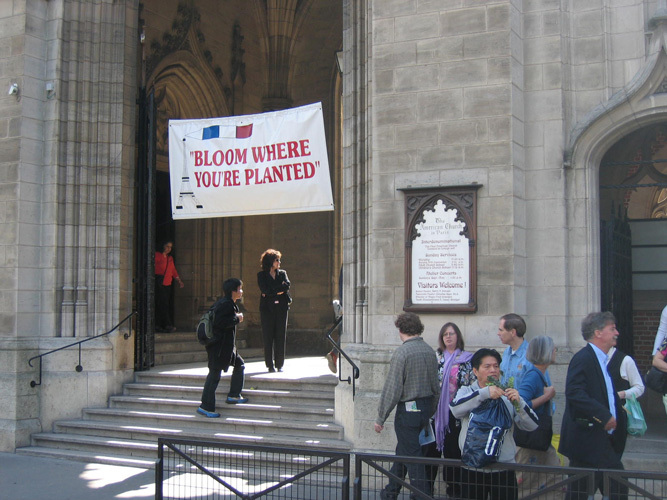 The Bloom program has become the premier source of information for English-speaking expats in France since 1965. Whether you've been living in France for some time already or have just arrived, you’ll find it very valuable! Adrian Leeds is one of the many informative speakers...speaking on "French Property the American Way." It may be Labor Day in the U.S., but it's Back-to-School Day and Back-to-Work Day for France. The city that was a ghost-town for most all of August is now hoppin' again and getting ready to take on "La Rentrée"– the "re-entry" of normal life as we know it. We arrived on French soil the morning of September 4th, 1994, so this marks our 24th anniversary living in the French capital. We hit the ground running to get our then almost nine year-old installed at a bilingual school a couple of days later. These images are etched in my memory bank as if they were yesterday when the culture shock hit us like a blast of hot air. Just like now, after the holiday season the kids got busy putting their noses into their books and all of Paris and France went back to work while we were discovering our new home. We spent our time exploring the city, having taken a kind of one-year sabbatical without working. In late 1995, while still living in Paris, but still not working, massive transportation strikes crippled all of France (and actually crippled me thanks to walking 10 times more than average) as workers rebelled against labor reforms that would increase retirement ages and eliminate thousands of jobs. They dropped that reform after three weeks of a nightmarish stand-still country wide. Again, the images of that period in Paris history are etched in my memory bank as if they were yesterday. A few years later, France adopted labor reforms that shortened the work week from 39 to 35 hours that went into effect January of 2000. The idea by the Socialist Party was to lower the unemployment rate (then at a high of 12.5 percent) by inducing employers to hire more employees to cover the loss of the four hours a week of productivity, rather than pay overtime to current staff. They also wanted to increase a person's standard of living by giving them more free time without it costing them a penny. What a novel idea. At the time, I thought it was the dumbest idea anyone ever had. My biggest fear was that it would encourage a bad work ethic and that it would make companies less productive, less profitable, and actually reduce their ability to hire more employees. The working-class French loved it (naturally) and now, there's no taking back the benefit. I was ultimately wrong. Studies have been made that can explain why it generally didn't work, but the bottom line is that it alone didn't decrease the unemployment rate. The unemployment rate today is 9.1 percent (second quarter 2018) and was at an all time high of 10.70 percent in the first quarter of 1997. According to recent studies, however, the 35-hour work week didn't make that much difference because employers got creative and adjusted the law to suit their own needs. The biggest problems today with unemployment have to do with the rigidity of the laws that make hiring and firing so difficult – something President Emmanuel Macron is trying desperately to reform. "Short hours, long breaks: Are French workers lazy?" No doubt, you may find it interesting to learn that in spite of the 35-hour work week, five paid vacation weeks a year, 11 public holidays, long lunch breaks (often with wine), and a long-standing reputation that French people are lazy, studies show that they are among the most productive people in the world. Somehow, even though the French enjoy a long list of employment benefits, they still manage to get quite a bit done, while we Americans working 50+ weeks a year think we know better with our "American work ethic. Most Americans get a whopping two weeks off, and many of those don't even take the time for fear of losing their jobs. One in four get no paid vacation at all. America needs to take notice that time off for workers makes them more productive and with their batteries recharged, are likely to have a higher morale and do a better job when they're on the job. It's worked for the French: working to live instead of living to work. When will we learn? P.S. Coming up at next Tuesday's Après Midi, September 11, Douglas Herbert, International Affairs Editor for France24. Details on our Après Midi page. Make your plans to attend now!